The Transportation Remix party at the Oregon Electric Station on October 22nd was a great time. The room was packed with over 100 people for the three hour event, and CAT’s valet bike parking was filled to capacity. 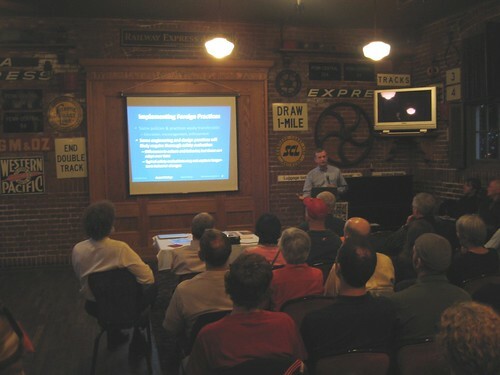 The event was part of the planning for Eugene’s new Ped/Bike master plan, covered earlier by WBE here. The first hour of the event had a party atmosphere with an open bar and snacks, followed by three 20 minute presentations and then an hour-long question and answer session with the panel. ODOT Bicycle and Pedestrian Coordinator Sheila Lyons did a great job moderating the event, and had much to add to the question and answer session. Update: Alan Pitman over at EugeneCycles.org has also published a great writeup of the Transportation Remix. He even included a link that I’d forgotten to mention: Elly Blue’s article on Grist about the “Safety in Numbers” phenomena, which was a large theme in Ed Fischer’s presentation. If you missed the party, or just want to live it again, take the jump for videos of the three presentations, copies of the presentation materials, and a slideshow! There is a lot happening this October in the Eugene bike planning world, most notably the Pedestrian and Bicycle Master Plan Open House on October 14th and the Transportation Remix on October 22nd. I’ll post about how awesome the Transportation Remix will be a little closer to the date, but for now I’d like to focus on the importance of the Ped/Bike Master Plan Open House. This project will provide a long-term guide for how cycling infrastructure is implemented in Eugene, and this open house will be a great way for you to give valuable input. If you can’t make the open house, don’t panic; the Ped/Bike Plan website has other ways for you to contribute. Also included in this post (after the jump) is the City of Eugene’s October InMotion Newsletter. It’s full of great information, including the above events, an opportunity to win an iPad, several public input opportunities for LTD projects and Envision Eugene, construction updates, and a whole bunch of other fun events. WeBikeEugene contributor Shane Rhodes wrote an update on what Lee is working on for the January 2010 GEARS newsletter, and has graciously allowed us to re-post it here. To receive the full newsletter yourself simply become a member of GEARS (it’s worth it). The City of Eugene is putting on the 4th Annual Eugene Walking and Biking Summit on Saturday, Jan 23rd 8:30-1:30pm. The event is located at Sheldon Community Center. For more details refer to the GEARS blog. Information on the new Ped/Bike master plan can be found on the city’s website.